Daylight Saving Time begins Sunday, March 11, 2007. Don opens card "from George & Laura Bush," left; Don & Dorothy, right. UPDATE --Thanks to my dear family and friends! Words cannot express the joy I had today as you came to observe my 80th birthday. To start the fun, the kids and grandkids and great grandkids took Grandma and me out to lunch at Rudy's Red Eye Grill. Really great eating!! After we finished lunch, we came over here to the Community Room for our dessert and snacks. I sure am glad the big winter storm cleared so people could come. I missed Heidi and Ryan, Zach, and Jessy ... but got greetings from them, as I did from many of you. Many here in the apartments noticed and came to me and said what a wonderful family I have. (Yes, people notice the genuine love shown!) This is uncommon in this world today. Thanks for the planning and getting everything in line to make this day one I will long remember. 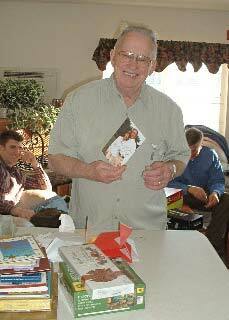 Also thanks for your cards with good wishes; I enjoyed going through them again. 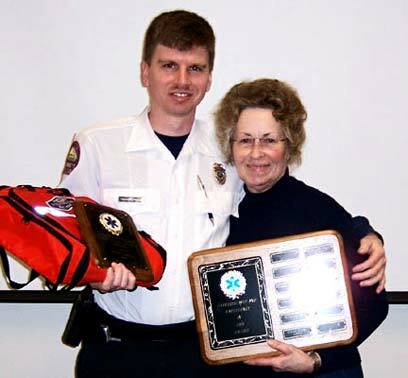 Anita Weiland presents 2007 EMS award to Troy Cowman. 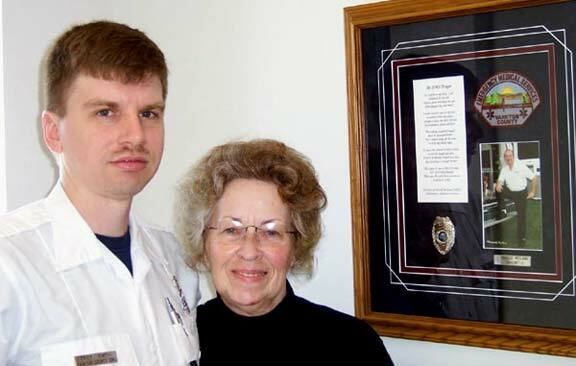 Troy Cowman is the Yankton Ambulance person who was awarded the Harold H. Weiland award of excellence for this year. His name will be added to the names on the plaque. Each year one who has proven to be an excellent EMT/EMS, as was described in Bulletin 188, is picked. Troy has been on the crew for over 10 years and is a very good EMT-I, Anita said. Now he is going for his paramedic training. He got married this last year and has a nice wife. He sure is a wonderful help to all, and also helps with the computers. Anita Weiland, Harold's wife, is also an ambulance driver EMS. They have given her the honor of presenting the award each year. Anita Weiland & Troy Cowman with Harold H. Weiland memorial plaque. 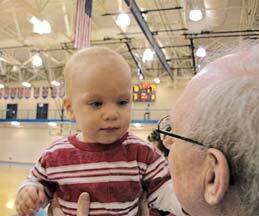 Mason Henderson discovers the thrills of a girls' basketball game. Thursday evening we went to the Region 3 Section 3 Class AAA championship Girls' Basketball game. We happened to bump into a young fan (Mason who happens to have a grey hairdo) and his parents (Ben and Heather Henderson) and Grandma (Ann Overby). 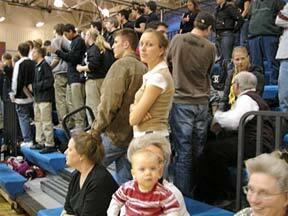 The game was held at Hastings High school. The teams were Academy of Holy Angels and Minneapolis DeLaSALLE High schools. The head coach of the DeLaSALLE Islanders is Brian Frye, son of Barb and Doug Frye. The Islanders (Home team) squeaked by the Stars by a mere two points after being down by 10 at one point in the game. The Islanders go on to play the Section 6AAA on March 14th at 2 p.m. in the Minneapolis Target center. In the excitement of the moment, the photographer must have been too trigger happy, so it is a bit blurry; nevertheless, they are distinguished. 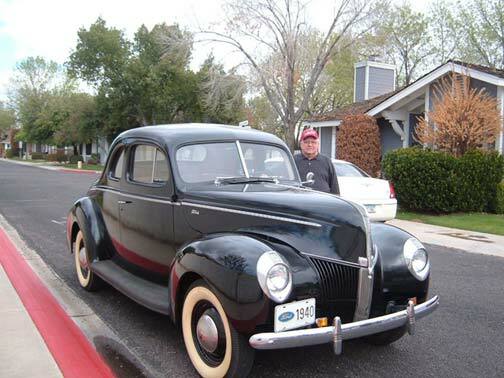 Right after retiring in late 1993, Chuck thought it would be fun to restore an old car ... so when they took a trip to Milnor, North Dakota, in the summer of 1994, he found just the car he wanted. 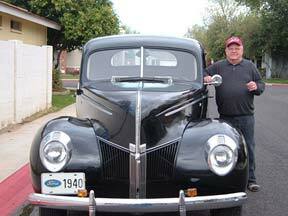 In the garage of Marlin Bogart (Marlin is Jill Bogart's father-in-law; Jill is Virginia Peterson's daughter) sat a 1940 Ford. Thirty-three years before, at an estate sale, Marlin had bought it from the original owner, who also lived in Milnor, North Dakota. Chuck bought it from Marlin and had it shipped to Arizona on a car hauler; it arrived in Phoenix on Thanksgiving Day 1994. Much family was gathered together for the holiday, and what fun when the car arrived, too. Chuck has done some work on the car ... put a new interior in and rebuilt the engine. It has 57,000 original miles and runs great. He enjoys taking his "pride and joy" to car shows and takes it out for a ride every few days. He says the "ole gray hairs" really love it and enjoy visiting about the old days ... the younger set would like to buy it and make it into a "hot rod" but Chuck says, "NO WAY!" 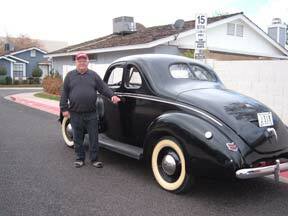 Chuck Anderson with his lovingly restored 1940 Ford. I have a Myelogram tomorrow, which I'm dreading; just riding in a car is very painful for me. Then it's several hours of lying as still as I can. Well that is over, and probably the hardest part was getting onto the table and also turning onto my right side, as that is the sorest. But it went fairly well. I am home and flat in bed for the next 24 hours ... but I can take calls, as the phone is right by my bed, so just call 218-747-2034 -- and visit. I am supposed to stay quiet for a total of 48 hours, but that doesn't refer to my talking. (Send us some to run; we will line them up in our staging area to take their turn. 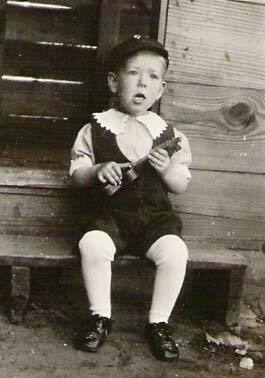 Thanks to LeRoy Dake and the photo editor for sending last week's mystery pictures. Well, once again I had the warm memories flooding my heart as I see the GUESS pictures. Don and Twila Johnson on their wedding day, very likely, and then it looked like pretty Blanche Dake Miller with, probably, Steve. I would never have known Twila, but Donald hadn't changed much through the years. Happiness is that couple, for sure. The guess picture to me looks like Blanche Dake Miller and Carol Dake Printz. Aren't those old pictures a treasure now? I have NO clue of those in the pictures this week. 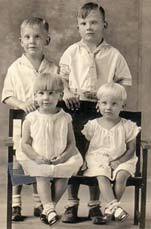 Regarding the GUESS picture of the four of us you so kindly printed in Bulletin 245: it was taken in the summer of 1966. Vern and I were back in Minnesota then. When Pop Kitto (Ken's father) passed away, the four of us got into Rich's car and we drove the 24 hours to Montana to be with our friends, the Kittos. Pop Kitto was very dear to all of us -- and the picture was taken in Pop Kitto's home, where he lived with his daughter, Pearl (Ken's sister). Many wonderful meetings we had in that home in our young married years. I was just was deleting old emails and found The Bulletin that Ruth Kitto sent to me some time ago. So I clicked on the current one. I saw the pix. The one on the right is Aunt Blanche Miller. I'm not sure who she is holding. Maybe a younger sibling? She doesn't look like she is married yet, so I don't think it is Steve. All now. 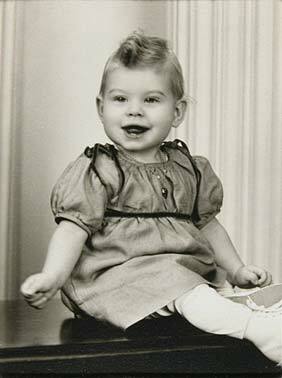 The little girl Blanche is holding -- I am sure it is me, Anita Pfingsten Weiland. I was going to write Sunday but didn't get a chance ... it looks like a lot of my little girl pictures. I wish I had a scanner to send pictures -- would sure be fun now with The Bulletin. You all sure do a wonderful job. I just love it and sure makes a slow Saturday end with good reading. Editor's Note: I asked Anita who she thought it was. Because I did not send the photo and because I doubted anyone would guess the child in arms that my sister Blanche is holding, I decided to add my "know" this time. That is Anita Pfingsten, and she certainly was popular the weekend that picture was taken. 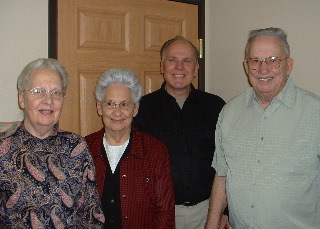 With my folks' approval, Billy, Blanche and I went to visit Lenore and Henry Pfingsten at Worthington (a long trip in that day) for the weekend. We wanted to visit and meet the newest member of the family. Anita was a little blonde and Blanche and I took turns toting her around. March 15-16, 1941 -- the most severe blizzard in modern history struck North Dakota and Minnesota. 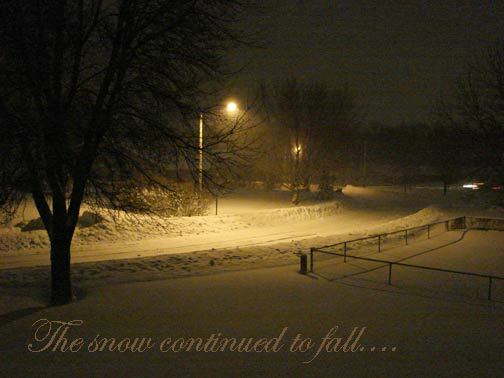 The blizzard hit on a Saturday night while many were traveling and resulted in the tragic loss of 71 lives. Winds gusted to 75 mph at Duluth, Minnesota, and to 85 mph at Grand Forks, North Dakota. 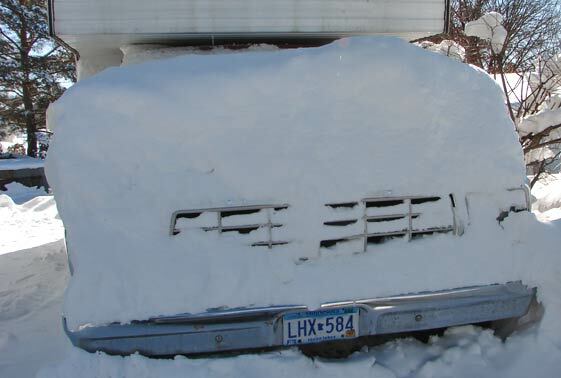 Snow drifts reached 12 feet in north central Minnesota. Beware the "Ides of March Blizzard"
I was so scared of babies that Twila didn't dare have one, to start with, but after four years she decided I might live through the ordeal. The cows were increasing fast then and I had about all the chores I could handle, milking by hand. We were going to have Jerrianne in March of 1941 and Twila's sister Marie was going to come from Utah and help that summer. Marie got here March 5th, Twila went to the hospital that night and Jerri was born early the next morning, so I had a housekeeper the whole time. Marie had quite a time cooking, to start with. She had never cooked on a wood range before. I came in and found her holding down on a kettle, waiting for it to cook, but she hadn't thought to fire up first! Marie caught such a cold coming to this frigid climate that she didn't go along to the hospital to see Twila and Jerri right away. The first day I went up to see them, a nurse came out into the hall carrying something in a blanket and said, "Do you want to see your little daughter?" I had never seen a newborn baby before and when she opened the blanket, I said, "Ugh! They're awful-looking things, aren't they?" Twila heard me and she sure hollered! Twila wanted to name the baby Jerry Ann, but Mrs. Risse, the head nurse, wouldn't put a "boy's" name on the birth certificate, so Twila and Marie settled for "Geraldine Annette," thinking they could nickname her Jerry Ann. We always called her Jerry or Jerry Ann and she never knew what her official name was until she was ready to start school. Later, when she was in high school, it turned out to be a mess. She got mail and school documents with so many versions of her name that we finally went with her to see a lawyer and a judge; when she was 18, she got her name legally changed to Jerrianne for $50 and she paid the lawyer herself. Twila spent most of the 11 or 12 days she and Jerri were in the hospital on what they called "the porch," with three other new mothers. I would bring them all malted milks from downtown when I came to visit. One day, Mrs. Townsend, the wife of one of Fergus's two malt shop owners, was there when I brought malts from their competitor's shop. Somebody came to visit her and she almost blushed -- and then made a joke about lying there, drinking one of their competitor's malts. They really had a ball, after the first two or three days, just lying around, visiting and being waited on. Ten days in the hospital was normal then, but Twila and Jerri had to stay another day or two, because of the "Ides of March Blizzard," on March 15-16, 1941. Marie and I went up to see Twila and Jerri on a nice, balmy, evening and stopped in at the City Restaurant for "lunch" on the way home. When we stepped back out of there, about 11 p.m., the wind was blowing the snow so hard you couldn't see two feet in front of you. It was almost as bad as the "Armistice Day Blizzard," the previous November. I think we were the last ones to leave town that night and when we got half way home, creeping along with the windows open, trying to see the road, we caught up to the Skaar brothers, going about five miles per hour. When we got to the corner, they didn't dare go north, where the wind hit harder, so they followed us home; they stayed until daylight and it was a little better then. I didn't dare touch Jerri for at least three months. After that I got so I could hold her, if she wasn't wet or anything and didn't spit up, and before long, I thought she was the cutest thing I had ever seen. As the old man pondered his predicament, the people at that crossing urged him to go on; he would certainly find fuel that would not gel in the horses. So going on seemed best. The day had started clear and cold ... but worse weather was coming. The clouds hung in the distance and spoke of change. The old man had hope that the horses might survive the bitter cold. 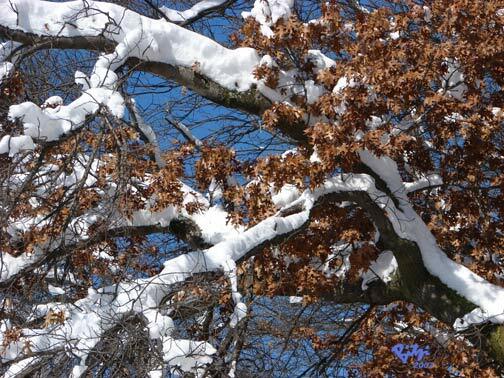 But he also had worries, as this weather change might also bring snow. The old man knew a winter storm in this rough country could deliver snow up to the bridles of the horses by nightfall, a real danger! Another problem: the horses mustn't have liked water very much; every time the old man drove them over a river they balked, as they didn't seem to like the water beneath their hoofs. They reared and jumped. He trusted these sure footed animals, though, and never once did they slip on the rocks or slide into the bank on either side. Once they crossed over an "iron horse" on the trail below them, and again the horses balked. Possibly, they had never seen a machine that big, or one that billowed such black smoke before. The old man took courage; he was not totally alone, as he had now seen other lone souls passing -- working at conquering the wild, wild, west. The passes in the mountains that lay ahead were rough and remote. They would be the real test. "Bridger Pass" was one of the first passes in the journey from the Midwest into the Far West. The climb into the Bridgers began a long way back, as if one was climbing out of the valley and into the clouds. But as of yet, the clouds were not the serious threat experience had taught the old man they might be. Darkness enveloped the old man and team as they approached the Absaroka range. The old man ran it off his tongue, "Ab-sa-rok-a." But the native Montanans pronounced it differently: "Ab-so-roke," they say, something like the combination of the two words "absolutely" and "broke." The old man remembered back to when he was a child, remembered that there was some folklore about a crazy woman who ran away into this Absaroka range and disappeared into these mountains. Any terror by man or beast that was ever found in these mountains would always be attributed to her. I have two more guitars, well, three actually, but two that I'm going to feature, and I need to take some new pictures. So, this week, I'll tell you another story instead. I think it happened around the same time as the "porridge" incident. I was raised in a suburb of Winnipeg. About a half block from our house was a fast little river, called "the Seine." It was forbidden to all the kids my age to play around there, as it was a dangerous place. So, of course, we all played there. One winter day, being adventurous, several of us lads wandered along the river and came to a tree that had conveinently fallen all the way across the river. It made a perfect bridge for our brave group. After safely crossing, we wandered around and came across some low hills on the other side of a field. They were probably 20 feet or so high, perfect for sliding. No sleds, of course, but nice wool pants worked well on these snow covered hills, and we enjoyed much of the afternoon climbing and sliding down. When I returned home, with pants very dirty and wet, I had to remove them immediately and put them next to the stove to dry. Soon the house started to smell, then really stink, and windows and doors had to be opened ... and Mom finally found the culprit was the pants, which were tossed outside. The problem? Well, it seems the area we were playing in belonged to a company called Canada Packers, a meat packing and slaughtering outfit, and the hills we played on, and the "dirt" ground into our clothes, came from the by-product of the holding pens of the stockyards. It took many washings to get rid of the smell, and my punishment -- besides a spanking -- was I had to wear these pants to school, and you can imagine the comments from the other students. Except of course, the others who had been with me and suffered a similar fate. Funny, now that I think on it, all the mothers had the same idea, to make us wear the smelly clothes. We still had fun down at the old Seine River, but I didn't cross again it for years. Elwood, Donald, Elaine & DeLoris, left; DeLoris, Elaine, Dwight & Donald, right. March 3, 2007 ... What a memorable day! After three days of relentless blizzards, we felt so fortunate to have cooperating weather to get to "Big Brother" Don's 80th birthday. It was a long anticipated event and now the big day had arrived! And what a day it was! The ecstatic clan had gathered -- all ages, all sizes, a happy- go- lucky, carefree group , all bearing mouth-watering food to add to the festivities! When the day had ended, I pondered over what "Big Brother" really meant to me! Not everyone is fortunate to have a "big brother," since someone has to be the oldest! And that is Don! Big brothers come in all sizes -- fat and thin, short and tall, bald and bearded, all descriptions ... but when they reach 80, they "settle down" and become more bent and wide! However, one does not measure a big brother by his expanding waistline, but by the circumference of his heart. Big brothers grow up before their time. As a young kid, he delivered milk to townspeople in Karo syrup pails, by wagon or bobsled, depending on the season. Those few cents per pail added much to the family income. At age 10, he plowed down sweet clover with the tractor, with legs a bit too short to reach the clutch pedals. I felt so big to carry the water jug to the field when he was shocking grain, or pulling mustard weeds from the fields. Big brothers are patient teachers. They reflect a dandelion under your chin to see if you like butter. They can hum a tune on a tissue covered comb; they hold a chair on the ice to teach you to skate, or hold the old bike, or horse, when you are learning to ride. Big brothers "break the ice" for those younger siblings when they start school or other new experiences. Big brothers are magical. They can make hockey sticks and slingshots from a tree limb. They can saw checkers from a broomstick; they build stilts, show us how to spin a button on a string, how to bat a ball or wade in the creek, how high to climb in trees, how to roll in a tire down the sidewalk. They will teach us a ditty to sing while turning the cream separator to make it seem more fun! Big brothers teach us how birds and gophers need funerals, too. Big brothers know the secret places where the gooseberries, chokecherries and best sugar plums grow in the woods, so we can tag along and help pick fruit for mother's jellies and sauces. But, big brothers also teach pranks! Like playing with matches in the attic, causing a fire, and naughty Halloween tricks. Or his pet billy goat butting us, causing us to run and cry -- or telling us oysters in stew were worms. Big brothers would spin us so hard on the merry go round, or so high in the swings that we felt like we would throw up -- as we heard chanting from other kids: "I see London, I see France!" Yet, big brothers will defend, protect, and guard if anyone teases or threatens little siblings! And yes, there was sibling rivalry, too! Our parents heard much about "He did it" -- "She did it." "He started it" -- "she started it!" "It's her turn to do it," "no, it's his turn!" "You took the biggest piece," etc. There was always someone else to blame for things -- and it usually was big brother -- because, in Mom's words, "YOU are old enough to know better!" Big brothers make it possible to laugh and cry together. How can I ever forget the fun times shared: trips from the Atlantic to the Pacific, from Washington state to Washington, DC. But there were times of tears, too. I cried when he went to the hospital for appendix when he was 9 years old, as I thought that's where people went to die. I cried when he fainted, portraying Joseph, over the manger in the Christmas pageant, thinking he had died. I cried when he left for service, and when he got his car sideswiped when taking me for a teaching job. I cried when he got married, knowing another gal would share him from now on, and I sobbed when he called to tell me about Kristin and Alexis! Big brothers are "keepers"! They still keep smiling, keep helping, keep encouraging, even at 80 years of age. Big brother endured many hard times in life, including 20 surgeries -- cancer, open-heart, gangrenous gall bladder, many back surgeries. Big brother keeps plodding along with the ups and down of raising a family and caring for a handicapped wife. But we can all depend on Big Brother to keep smiling and always be there to help us in any way he can! But to find the most important reason for me calling him Big Brother, just consider the the size of his heart! Thanks for the nice card! My brother Jim, his son Michael, my cousin Donald Mosier from Cedar Rapids, Iowa, and myself are heading for Daytona Beach, Florida, for a motorcycle rally. We just pulled into Tifton, Georgia, after two long days of driving; we'll be in Daytona in four hours. Thanks again for remembering. 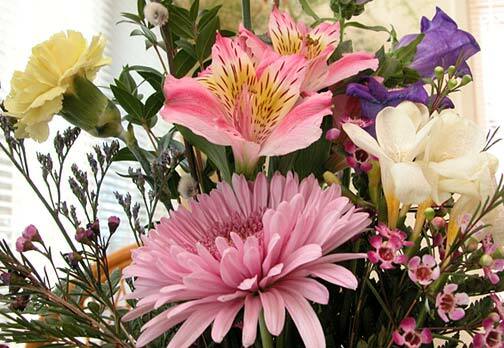 Detail, Jerrianne's birthday bouquet from Sharon Nault. "You've probably heard that Elvis was fond of peanut butter and banana sandwiches. A recipe for banana cookies with a peanut butter filling showed up on the Smucker's web site and it didn't take long for the Elvis reference to appear as the recipe migrated to other web sites. I thought it sounded good, even without the celebrity connection, but I like bananas and Nutella even better than bananas and peanut butter, so I switched the filling. "Nutella might be considered "yuppie" peanut butter. It is a chocolate-hazelnut spread that is simply divine. I don't actually eat it straight out of the jar, but I know people who do. Around here, they sell Nutella at Safeway -- it's in the section with jams and peanut butter." So Miss Jerrianne has been well and thoroughly birthdayed! She still has some "Elvis" cookies and I noticed that she bought a jar of that "yuppie peanut butter" at the grocery store, too! I bet she's planning for S'mores! This last Bulletin is a real treasure! So many memories revived! It was a great surprise to see Barb's picture! Welcome to my dear friend, Barb Floyd! She mentioned the years we have been close friends ... tear jerkers -- remembering! Thanks, Julie Sandon, for bringing her to this "family! We were neighbors for several months the first years of her marriage -- and then they had to move to Arizona. At that time, Arizona was almost another country. I am even getting to recognize some of the other "family" members now -- and can rejoice with the families and their newborns -- miracles! With eager anticipation we wait each Saturday morning -- to get another "treasure"! This will be short and sweet ... as I will soon be on my way to chemo. I received the pictures of the puppies that you scanned and sent back to me a day or two ago, and thank you. Yes, they are growing like weeds, and what one doesn't think up the others do! Such busy bodies! I am so terribly sorry to read about the family having to put your sweet little one to sleep. Such hard decisions to make, but it does sound like it was the best decision. I loved seeing the pictures of her in The Bulletin. There is something cozy about a lot of snow if one can just sit in and look out with someone else to do the shoveling etc. and if one doesn't have to go out in the cold ... (now that we are old)! But when I was YOUNG and in grade school, we would get the three-day storms and school would be cancelled and we would get our sleds and cardboard and slide down the riverbanks and make tunnels in the snow. 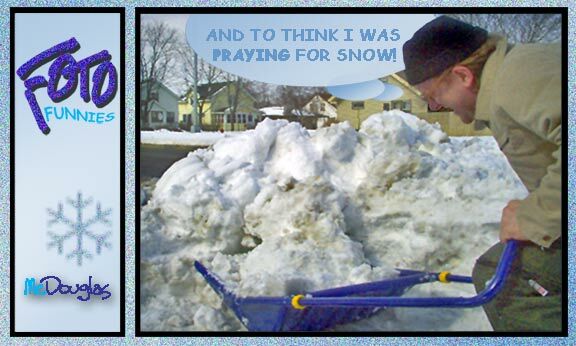 It sorta depends on one's age if snow is welcome or not. 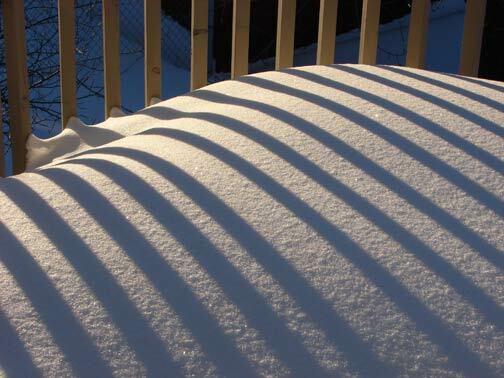 We could hardly wait to see what the first picture would be for this week, as we have had snow, snow, snow, and more snow, so we predicted that first picture would likely be about snow. Well, it was, but very much more interesting snow than looking out at our huge drifts. Those sculptures were original creations, like the water faucet on the bear and the bear cringing... Typical of Alaska, and they likely won't melt away very fast. The article by Nick Coleman was probably not even understood by a lot of the younger folks, but when you lived in the days of the Weatherball, which is no more, it was extremely interesting. Thank goodness our driveway was cleared by a very kind neighbor. Roy and I are finally beyond that job anymore, but we love Minnesota and we love our home, so we have no desire to go elsewhere for the winter. We just stay home when it's cold and icy. 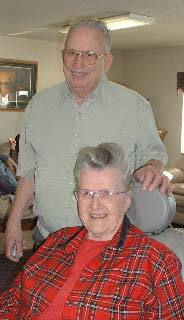 Fun to read about Anita Weiland's EMS supper in Yankton, and about all their snow there. It wouldn't be easy to be alone and have to do all the snow clearing by yourself. 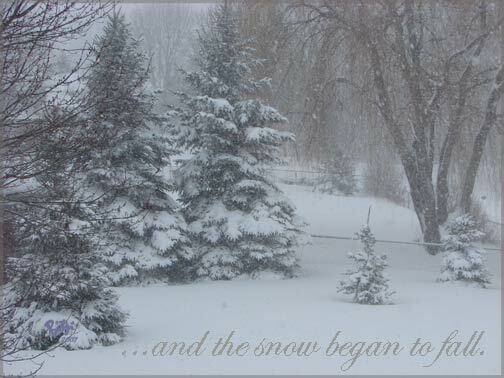 Then Kristi Indermark had another version of the snow. The storm was pretty general, and really, it was beautiful. She said that was their first blizzard together, so the kids would have loved it. We will be able to watch Madi Mae's progress, with her right here in Minnesota now. I see her dad's eyes, or am I imagining that? Such a sweet, perfect, little baby girl. A mother and stepfather would be like built-in grandparent babysitters. Keep us informed on the events, please. I was so pleasantly shocked and surprised to see Barb Wheeler Floyd's introduction as a new subscriber. I laughed at her descriptions, and it is only too true that she and my brother Harold were the kids we tried to bribe into leaving us older ones to our fun while they enjoyed malts we paid for. Those were definitely the good old days. Barb is very talented, original, and we are in for some grand treats with the stories and pictures she'll be sending in. She inherited a lot of creativity from her mother, Jean Wheeler. The background and the cute car tells us life is good in sunny Phoenix! I clicked on the Country Register site, and it will be most interesting to read in detail. I really had been anticipating a report from Rich Johnson, which seemed long in coming, but finally we had a story -- but wait -- it wasn't about his trip west at all, or wait -- could it be? And thank goodness it is to be continued so we find out what happens to whoever that man turns out to be. I truly feel sorry for those Mindy leaves behind. I never had a pet, but I have observed a lot of folks grieving over pets that are no longer with them. It is real, and it is very sad, and we want you folks to know we are thinking of you. You had no choice but to do what you did for her. I clicked on the story for Mindy's Friends, printed it, and plan to read it thoroughly, later on this evening. For some reason this Bulletin is so interesting, and I couldn't believe I had already read all 31 pages when I saw there were no more pages to read! Another Bulletin, devoured and appreciated by both Roy and me. Capt. Jack is so original. 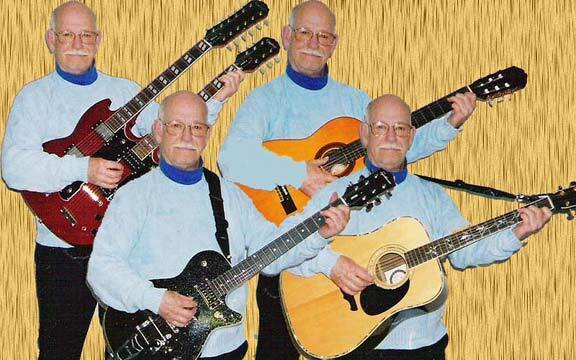 We loved that account, and had to study that picture of the two-necked guitar and four-armed person to not miss any of the details in it. Jess and Louise Cloyd will be so happy and so touched to see their wedding picture in The Bulletin. What an interesting account of that wedding, with all its glitches. I see that was 62 years ago, so it has lasted through many more ups and downs, for sure. Anytime you want to, just write that story of the honeymoon with the two kids in the '49 Ford. We will be waiting. We need a recent picture, too. I love sending in something to The Bulletin, but I always feel a little groan to see it in print. I never feel quite competent enough to have a story beside these other great scribes in The Bulletin family, but I do my best. Thanks for putting in the picture of Krista helping me open my birthday gift from Rich and Verlaine. It was in that insulated box, all wrapped in beautiful paper, and when Rich handed it to me he said, "Don't tip it, hold it straight up," etc., and I was so careful. Come to find out, it was a well sealed and packed bottle of vanilla from Mexico. That is famous vanilla, and I was glad to have it. I felt silly the way I had handled it so carefully, ha. But that was typical of my brother! I was thrilled to know that baby Madi can use the computer already, so we will be getting some stories, even though her mom or dad is too busy to write them. 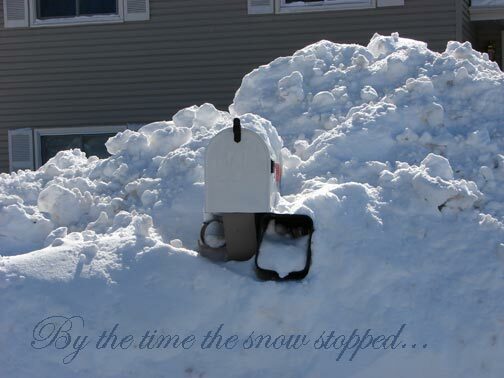 Cute story, Madi, and just wait until you can get out there in that snowbank! Miss Kitty can type, too. The LTTE from Steve Miller was especially precious to me. Thank you, Steve, for remembering my being there with Marjorie, probably in 1959-60. I wish you could visit Edith sometime. She is in a rest home, content, but can you imagine how lonely she must be after having a home that was "grand central station" for so many years? Everyone loved Edith, and they still do. The Chuckles with the photo of the dog on the table, where the dog could look at it all the time. Cute and clever! Photo by Doug. Doug, is that your dog? Yes, Bitzi, we noticed that the colors all matched nicely through the whole Foto-Funnies illustration. Roy is sitting here, waiting patiently and quietly for me to get this finished so he can have some supper. This is Sunday evening, and I wanted to write this while it was still all fresh in my mind, before the fizz settles, of another great and valued Bulletin. Thank you again, Editor and Photo Editor, and all who work in the background.